Many businesses that can already access fibre broadband are using it to maximise growth, expand their customer base and improve their bottom line. In Leicestershire, there’s a surprising amount of people who work from home and a large number of businesses operating from family homes. By having fibre broadband, not only will you be able to benefit from faster upload and download speeds. You can also run meetings by video link and reach customers through new, faster, and easier to track methods of communication like Facebook and Twitter. Alongside programmes such as cloud based Customer Relationship Management (CRM) systems, with high speed fibre broadband you can access the same tools as larger companies – with the same benefits, but for a fraction of the cost. Booking is now open for this years conference! Claim your free place here. The Digital Growth Programme runs events, workshops, and seminars throughout the year to support SMEs to learn and grow, with their conference being a highlight of their calendar. Find out more about their current events here. 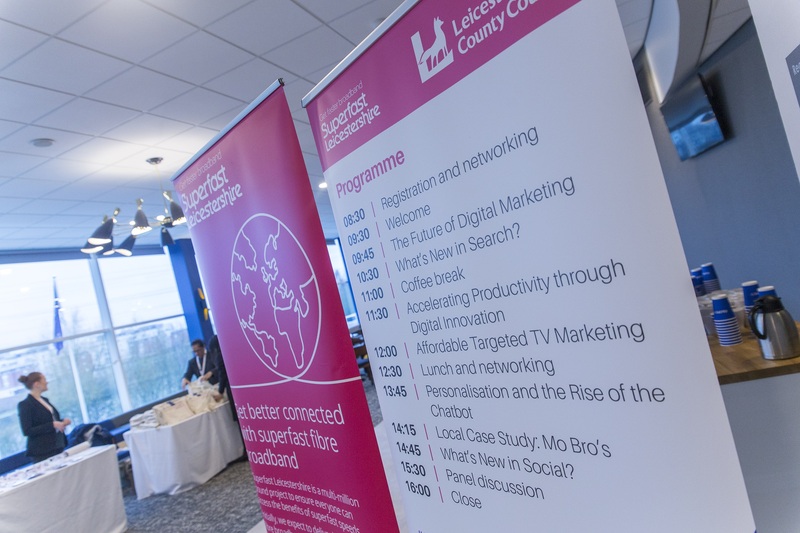 The Digital Growth Conference is an annial event hosted by the East Midlands Chamber and Leicestershire County Council. The aim of this conference is to help businesses across Leicester and Leicestershire make the most of the very latest digital technologies. 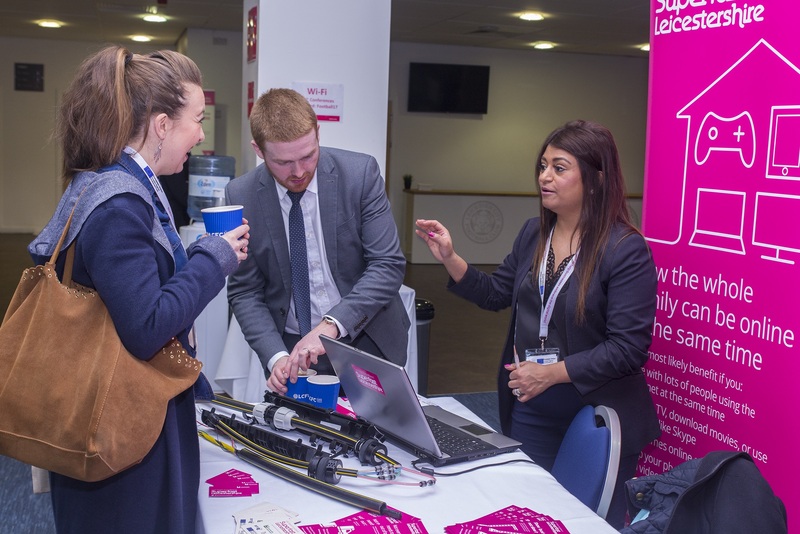 2018’s Digital Growth Conference was held on Thursday 15 March at the King Power Stadium and was attended by nearly 300 people. 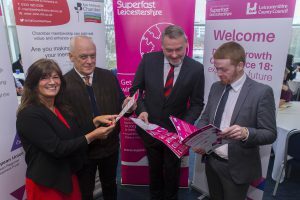 “Superfast Broadband is a complete differentiator…if you can get superfast broadband from Superfast Leicestershire then do it”. We also heard from Sky about the power of targeted TV marketing, social media expert Paul Ince on what new features we can expect from our favourite sites, and local success story Mo Bros who set up their beard grooming company with £750 and now make £1.3million turnover thanks to digital skills they learnt via the Digital Growth Programme and their success on BBC Dragon’s Den. 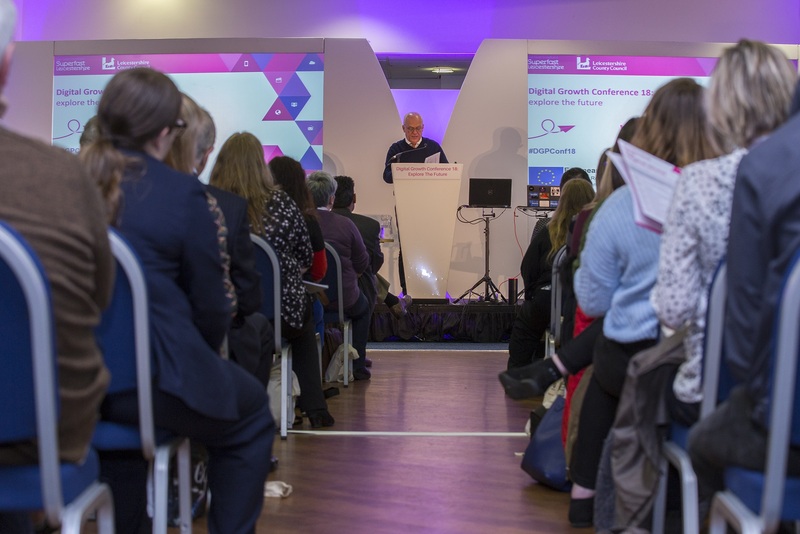 To attend events like this and to make use of the hundreds of courses and classes organised by the Digital Growth Programme, delegates must register their business with the Digital Growth programme, but registration is free. This recently launched £67m scheme is a government led initiative intended to help create a full fibre Britain. 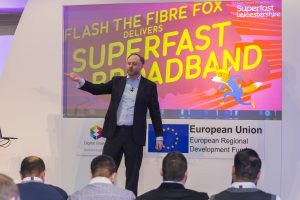 It is primarily aimed at SMEs who can claim up to £3,000 against the cost of the connection to a gigabit (1Gbps) broadband network either individually of as part of a group project. Residents are able to benefit from the scheme, however can only apply alongside an eligible business at a maximum ratio of six residential applicants per SME. Residential funding can account for half the funding total, equivalent to £500 per resident. For the full details of the scheme visit the national government Gigabit website. 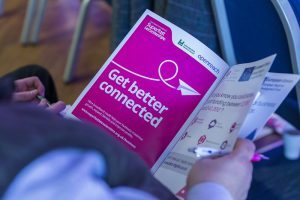 Rural England CIC and Scotland’s Rural College (SRUC) have launched a research project, supported by Amazon, to explore the economic potential where businesses in rural areas take-up digital opportunities arising from broadband, mobile and other networks. Owners, directors and managers from rural businesses across the UK are invited to take part in a survey that will provide valuable information to a key part of the project. The best rural locations to set-up and manage a digitally-empowered business. Survey responses will be treated in confidence and we encourage you to share the survey with other rural businesses you might know. The survey should take no longer that 10 minutes. Leicestershire County Council contracted the Chamber of Commerce to deliver a business support service to boost innovation, growth and job creation. More information is available on the Business Support Service page. Since the beginning of this project there have been a number of businesses who have upgraded to fibre broadband. Read our case studies to see what a difference it could make to your business no matter how large or small.